Twigs makes stunning floral arrangements ideal for the office, home, or special event. Like a restaurant, with a special of the day, they buy the best freshest flowers every week, so our Everyday Occasion arrangements constantly change. Our professional floral designers (with 30 plus years of experience) select and arrange the flowers that best suit the purpose and mood of the occasion. They specialize in corporate floral needs, with Weekly Corporate Arrangements For our retail clients, we offer seasonal Holiday Flower Features. We can deliver anywhere in Calgary, and even around the world. Order your flowers from Twigs today! Their store is located in the middle of downtown, and Twigs has served our downtown clients since 1996, and the owner, Colin Logiss, has been in the floral business for 32 years, as have many of his floral designers. 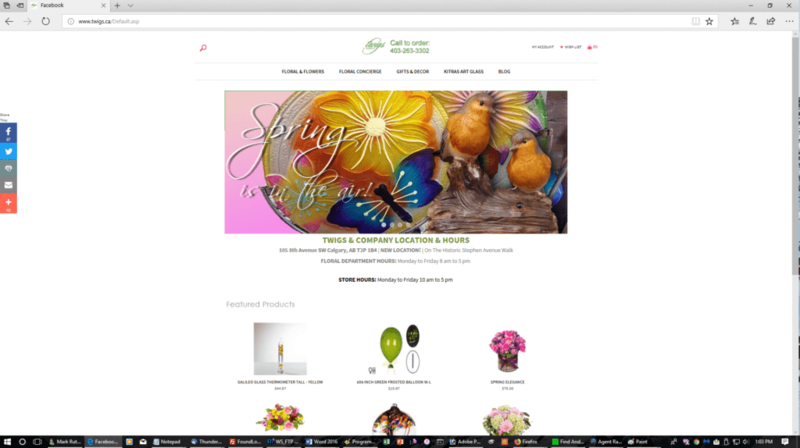 Their current site is an e-commerce site on the popular Volusion platform. We also write and design their weekly Constant Contact newsletter for the customers.